Limota Goroso Giwa, born in Ilorin, in Kwara state of Nigeria, was raised by fishing grandparents. Her father, an imam (leader for Muslim prayers), died when she was 11. She studied human rights at the University of Columbia and obtained her masters in social planning. 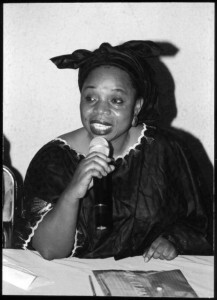 A senior advocate on womens rights and coordinator of women and fishery projects in riverine communities in Nigeria, she occupies several humanitarian posts, among them coordinator of the Pan-African and West African Women. In addition, Goroso Giwa addresses issues around the trafficking of Kwara women to Saudi Arabia. For more than 20 years, Limota Goroso Gewa has held workshops, visited communities, counseled, mobilized women and girls to promote womens rights, justice, and fairness. Being a native of Kwara, a Muslim state where most of the men do not want women to go to school, Goroso had the incredible idea of creating an NGO, the International Womens Communication Center (IWCC), focusing on girls and married women who have not had the chance to go to school, as well as orphans and street children. Events between 1999 and 2000 between Muslims and Christians caused enormous damage: many houses were burnt and many lives were lost. Goroso fought to re-establish peace between Muslims and Christians, bridging the gulf between these two large religious communities. She initiated and presided over the Committee for Peace between Muslims and Christians of Ilorin. It is thanks to her efforts that the youth and religious groups today live in peace. Initially, her mediation was rejected as she was taken for a woman who tried to substitute herself in a mans role in a sensitive conflict. Religion aside, it is difficult for many to understand why the daughter of an imam strove for peace between Muslims and Christians.